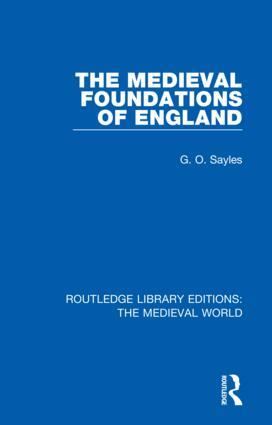 Originally published in 1948, The Medieval Foundations of England is a chronological framework of the history of ideas and action during the medieval period. The book discusses the fundamental problems of medieval life in England, examining the agricultural foundation of England, the impact of the Anglo-Saxon and Scandinavian civilizations, the feudalization of society, and the interpenetration of Anglo-Saxon and Norman civilizations. The book also examines the issues faced by the ‘New Monarchy’ of Henry II and the development of Parliament, it also examines how the intellectual Renaissance of the twelfth century affected medieval society. The book critically examines the historical sources of information and provides a reading list for each chapter. The volumes in this set, originally published between 1938 and 1994, draw together research by leading academics in the area of medieval history and medieval literature, and provide a rigorous examination of related key issues. The volume examines medieval history from the early Middle Ages, right up until the Reformation, as well as the effect of the medieval period on later cultures, such as the Victorians. This collection draws together books on the monarchy, medieval philosophy, religion, art, music, psychology and architecture as well as volumes on medieval archeology. The collection also brings together key volumes on medieval literature of the period, with formative works examining medieval religious literature, medieval legends and oral tradition. The collection also includes titles examining specific poems from the period such as Piers Plowman, Sir Gawain and the Green Knight and The Pearl, as well as volumes on influential writers of the period such as Jean Froissant, John Lydgate and Margery Kempe. This collection brings back into print a collection of insightful and detailed books on the diverse medieval period and will be a must have resource for academics and students, not only of history and literature, but of anthropology, music, psychology and religion.